Cancer Research was delighted to be presented with a cheque for £20,223 from Redditch businessman, Dean Attwell, who trekked to the North Pole in April to raise funds for the charity. After undertaking the greatest challenge of his life, Dean, the Chief Executive and Co-Founder of Redditch-based family business Oakland International said: “I am tremendously grateful to everyone who has been so generous with their donations, help and support throughout; before with my training, fundraising, during my trip and the encouragement and the support of the Polar Explorers Expedition team and our guides, and following my return home as donations continued to come in. 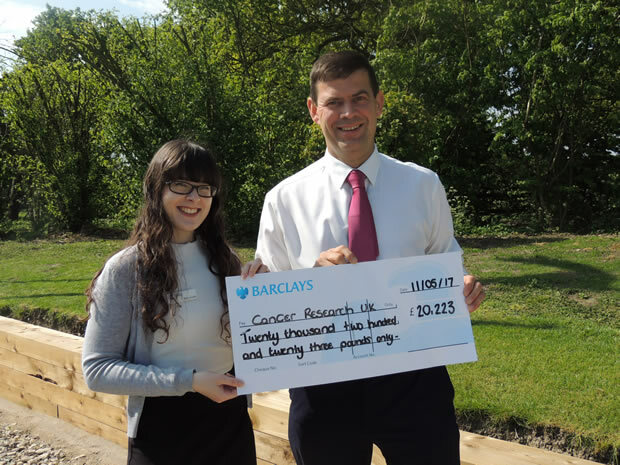 Ellen Jurczak, Cancer Research UK’s Local Fundraising Manager, received the cheque on behalf of the charity. 100% of donations raised from the expedition have been given directly to Cancer Research UK.